Beautifully Restored Brick Home, Sleeps 8, Two Miles From Lake Charlevoix. Cedar Creek Guesthouse is located one mile from canoeing and fishing on the famous Jordan River, two miles from Lake Charlevoix, and next to the Jordan River Valley bicycling, hiking, and snowmobiling trails. 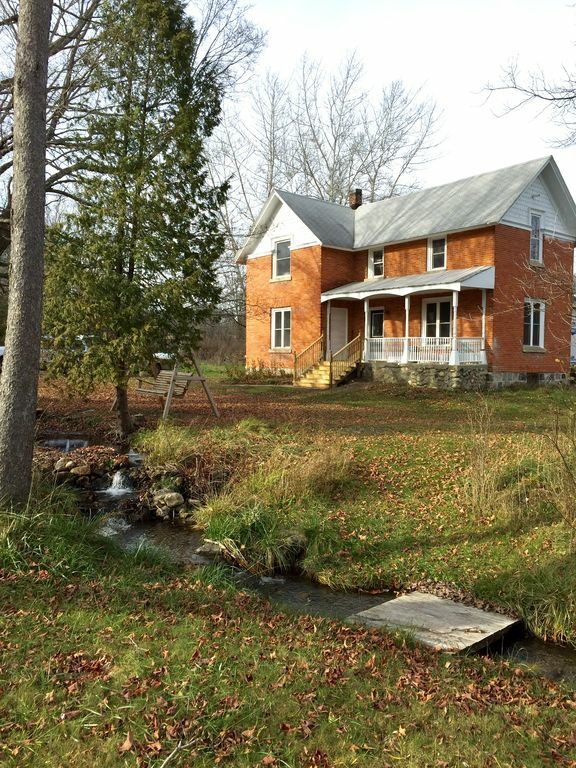 The home sits on 30 beautiful acres with two scenic trout streams running through it. The home features 4 bedrooms with Queen and King size beds, two and 1/2 bathrooms, a full kitchen, living room, laundry, and dining room. We purchased this home four years ago as a 2nd home located in an outdoor paradise. The house was built in 1895. We totally restored the home right down to the beautiful maple floors. Cheryl is a public school bus driver and owns her own Northern Michigan Trolley business. Steve is a full time protestant pastor in Gaylord, Michigan. We have 5 children and 11 grandkids. We were looking for a small farm to enjoy, close to water and the beautiful west side of Michigan. This property is the most unique 30 acres I have ever seen. Two trout streams-forest, rolling hilled with a beautiful Cedar forest along 300 yrd of the stream right in the middle of the property. It was also loaded with wild life. Bob-cats, deer, rabbits, grouse, squirrels and birds abound. located 1/2 mile from hiking trails, the breezeway scenic road trail, Lake Charlevoix, excellent fishing and hiking through the Jordan River Valley, sightseeing along Lake Michigan, and the excellent fishing, canoeing and boating nearby. master bathroom is very large with two beautiful sinks and large mirror area. the small city of East Jordan lies just 2 miles away. a short bicycle ride away. Known for it's lake Charlevoix marina, great beach, quaint main street and Blue Smoke restaurant. Located on a beautiful property with trout streams running through it . 1/2 mile from the famous Jordan River and river valley. Hiking trails, water tubing, trout fishing and canoeing. a beautiful trout stream with small waterfalls lies in the front yard of our property. spices and regular /decaf coffee is provided. is a total restored farm kitchen with granite counter tops. the cabinets are over 120 years old and fully restored. the lawn is spacious with many trees and a trout stream with waterfalls running through it. the home is located on 30 acres of beautiful woods and fields to cross-country ski on. Boyne mountain and Shuss mountain are within 20 miles. 5 miles away. Shanty creek and Boyne mountain golf courses are within 20 miles. Less than 1 mile from Jordan Valley Barn Wedding venue and Event Barn. 2-Miles from Lake Charlevoix Public Beach/Boat Access - All Sports Lake. 1-Mile from Jordan River Access. 2-Miles from Convenience/Grocery stores. This house is charming and we enjoyed our stay the week of July 4th. Lots of charm and very tastefully renovated keeping the original character of the house. Was lucky enough to book this home last minute on 4th of July weekend. The house and property are absolutely gorgeous. This house is huge and has everything you need and more. The interior is something out of a magazine. The bed is the master bedroom is one of the most comfortable beds I have ever slept on. Cheryl clearly have an attention to detail and that's coming from a creative couple (photographer and architect). The property is beautiful and only minutes away from the beautiful Jordan River, a fisherman and kayaker's dream! This place is at the top of my list for sure! excellent trout fishing, canoeing, tubing opportunities. It is also close to many wedding venues. The Jordan Valley Barn and the Castle to name a few.